Technical analysis of seasonal spreads is not complicated but requires specific tools, which are not available in common retail trading platforms. We designed our platform with all seasonal spread trading nuances in mind. We give you thousands of strategies and smart search engine to select the strategies which suit your trading style. Custom indicators - Spreads moving in channel or at historical extremes, quality of the seasonal pattern, long and short term patterns correlation, open profit/loss in the seasonal window etc. Available retail trading platforms don’t allow seasonal and spread backtesting at all, because of its specific requirements. So we feel there is a lot of room for improvement and we started to work on full feature advanced backtester for seasonal spread trading. Nowadays it’s a still concept but we are working on a new version. It's very important to be notified when some expected or unexpected market situations arise. Broker's platforms usually don't support alerts for spreads. In our platform you can set up alerts for both outrights and spreads. Price alerts - Can be set for individual charts in portfolio to watch price. Open P/L alerts - Can be set to watch open profit/loss of whole portfolio or individual charts (positions). Date alerts - Don't miss your seasonal window entries and exits and other important dates. Seasonality is one of the significant forces influencing commodity and futures markets and stands behind periodical price movements at specific times of the year. Seasonal behavior can be explained by many fundamental reasons, like weather cycles, trends and patterns in consumption, important annual events and many others which cause changes in supply and demand. Although we don’t have to know all seasonal fundamentals, with enough of history data, knowledge of statistics and data mining, seasonal patterns can be discovered with the help of computers. 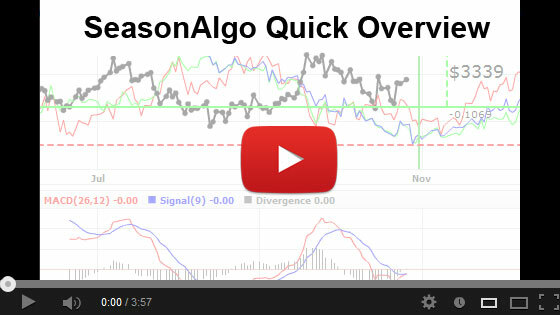 Seasonality can give us a solid edge and base for building profitable trading strategies.